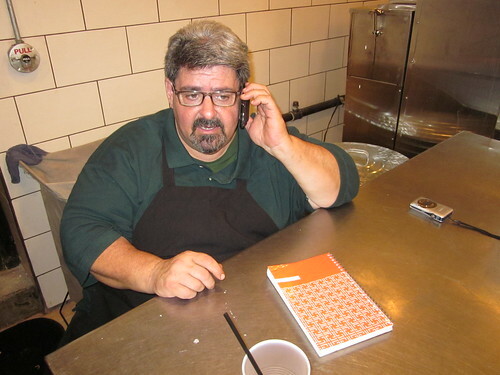 When Bob Zrenner, chef at Hubbard Inn, PM’d me on Facebook asking if I knew of anyone who could be Pitmaster as his new restaurant (at that point unnamed), there was no hesitation: Gary Wiviott is the man you want at your pit. 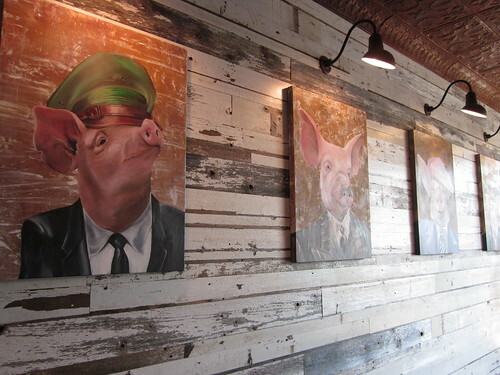 I don’t think anyone in Chicago or maybe the country approaches BBQ with the passionate studiousness, the downright fetishistic attention to detail of Wiviott. 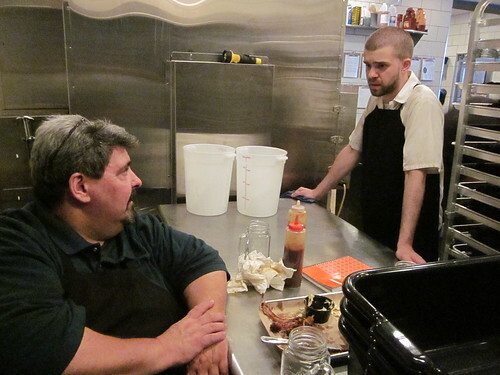 I’ve probably eaten 20 pounds of BBQ on various occasions in Wiviott’s backyard, but Zrenner’s new restaurant – Barn & Company – presents some new challenges to the old master. For instance, instead of cooking for maybe 80 friends, working in a commercial kitchen demands that you cook for 100s of strangers, every night, day after day. It can be a drag, though Wiviott shows no signs of that. In fact, I'd say I've never seen him more in his element. Still, there’s a lot to get used to in the transition between backyard and professional kitchen. Some of it is very welcome. “It’s a lot easier pulling pork,” Wiviott told me, “with a kitchen full of professional chefs as opposed to a bunch of drunken BBQ guys.” And who wouldn't love assigning clean-up to a bunch of guys half your age with twice your energy. But Wiviott also has to accustom himself to cooking on a Fast Eddy’s by Cookshack, a pellet smoker that Wiviott is studying as a scientist at Area 51 might examine an alien spacecraft. Remember, this is a guy who has championed the Weber Smokey Mountain and aquarium smokers, each of which can turn out only a small percentage of the volume of this massive stainless steel smoking machine. To maximize the deliciousness of what comes out of this industrial smokehouse, Wiviott is filling a notebook with observations and ideas. “Everything is always changing. For instance, you’d be surprised at the variation that results from the amount of product you put in,” and to enhance smoky flavor, Wiviott is adding some wood to supplement the pellets. 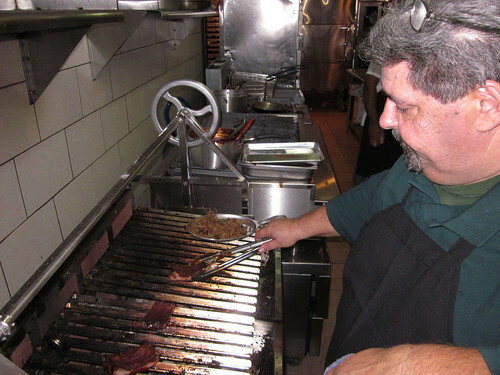 After pieces are portioned, they’re put on an Argentine grill to be lightly brushed with sauce (also designed by Wiviott) and finished over a lump charcoal fire to caramelize the meat and create slightly barky burnt bits. Because this is a soft opening (motivated, Zrenner told me, by the Taste of Lincoln Ave. a few feet from his door) the menu was limited. I had the sampler of ribs, pulled pork sliders, fries and cole slaw. Fries and slaw were excellent, and the pulled pork on the sliders was very moist and juicy with good pork flavor, though perhaps they could have used a bit more smokiness, and they benefitted from the Wiviott-inspired bourbon sauce. The ribs were very tasty and a hybrid of paradigmatic Wiviott Q prepared for a larger audience. As I said, I’ve eaten a lot of Wiviott’s Q, and he tends to go for toothsome, textured rib meat, and I do too, but I’m guessing if you asked 10 people in Barn & Company what they look for in a rib, 9 would say something like “fall of the bone,” “melt in your mouth,” or some other descriptor that is exactly not what Wiviott has ever gone for. But he’s cooking for these people and like any chef, he’s going to try to make them happy while maintaining some adherence to his own beliefs as to what makes for a good rack of ribs. The result is a delicious mouthful – his rubs and sauces, restrained in both heat and sweetness, really perk it up – a cross between Wiviott’s own preferred meatiness and what is apparently the larger public’s expectation that the meat be tender. It won’t fall off the bone or melt in your mouth, but if you know Wiviott’s Q, you will notice that you’re not working your jaws quite so hard. Maybe that’s not a bad thing at all, and that was just the case this afternoon. I suspect the taste and texture will evolve with time. Wiviott is the BBQ yoda in this kitchen, and he’s regularly consulted by the staff; I think they’re very lucky to have him (before he came on board, Calvin had been trying his hand at some Q, and it just wasn't working out). “How’s that guy to work with?” I asked a kitchen worker. “Yes,” he smiled, diplomatically. I'm sure Wiviott demands a lot of these guys, but that's probably part of the reason Zrenner hired him. 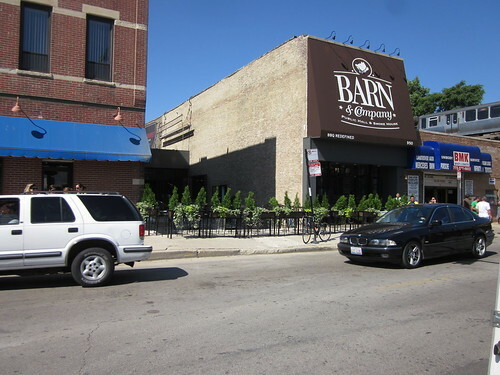 Barn & Company is designed to open up to the street so that the young and restless can breeze in and out, watch a little flatscreen, play some games, and maybe eat a little something. It's probably not the kind of place you would have expected Wiviott to be flexing his considerable BBQ biceps. While I was there, he got a call from his mom, “Yes, mom, I’m having a lot of fun,” he assured her. I have no doubt he was telling the truth. Cool, I'll be down at the Taste of Lincoln Ave on Sunday - Toad the Wet Sprocket is on at 8PM ($10 donation). I'll have to poke my head in and say hi. Just saw this news yesterday at tastingtable.com and was thrilled to read it. Thought maybe I'd missed a previous announcement here, but I gather this is the first. Lou Zucaro, Founder & Creator of Yumbly and MenuMinder. Search restaurants and menus to find exactly what you're hungry for. Yum. Ha, thanks, I'll make that correction. My ufology is a little rusty (but not my aluminum foil beanie!). David Hammond wrote: My ufology is a little rusty (but not my aluminum foil beanie!). Aluminum is quite handy for this, since it doesn't rust. When we do we get to see a picture of you wearing it? I've been told DEFCON on the mothership has been relaxed after your edit, thanks! Splendid news. Thanks for the great report, David. I look forward to getting a chance to taste the fruit of Mr. Wiviott's labors. The press release mentions hickory. Is that what what GWiv is actually using? scottsol wrote: The press release mentions hickory. Is that what what GWiv is actually using? I expect the great man himself to chime in to this thread with more detailed information, but my understanding is that hickory is now involved in the smoking process but that they're experimenting with different hard woods. Backyard amateurs (like me) tend to take a kind of loose approach to the process of smoking/grilling, but when there's so much riding on getting it right, and so much volume, fine-tuning the details is very important and I expect there will be adjustments to many elements in the process, including the wood used. I was getting worried these past couple of weeks when Gwiv's daily posts seemed to disappear. Now it all makes sense, the man has a lot on his plate...and he will soon be putting a lot on our plates. Can't wait to try it! Last edited by Sweetbread on August 1st, 2011, 4:47 am, edited 1 time in total. Also FYI, Barn & Co. has a booth/tent inside the Taste of Lincoln where you can get pulled pork or BBQ shrimp tacos. 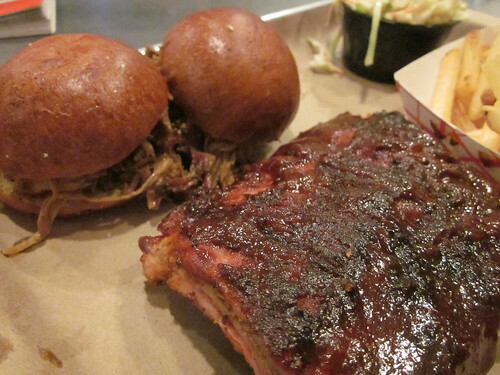 I had a couple of the pulled pork yesterday and they were delicious. A decent serving of pork, a little slaw, and some (I believe) red wine vinegar red onions on a couple corn tortillas. At 2 for $5, you can't pass it up. ziggy wrote: Also FYI, Barn & Co. has a booth/tent inside the Taste of Lincoln where you can get pulled pork or BBQ shrimp tacos. I had a couple of the pulled pork yesterday and they were delicious. A decent serving of pork, a little slaw, and some (I believe) red wine vinegar red onions on a couple corn tortillas. At 2 for $5, you can't pass it up. Shrimp tacos were tasty. Great texture on the shrimp with a modest smokiness. One of the better non-grill items at the Taste of Lincoln. Stopped in again yesterday evening for a pre-Paul McCartney dinner. I had the sampler platter again, and again it was great. My wife had one of the salads and really enjoyed it. It was hot and I didn’t want a beer. I asked the girl at the bar if she could make a Negroni. Her blank stare told me all I needed to know. She asked what it was. I explained that it is equal parts Gin, Campari and Sweet Vermouth. She asked how do you spell Campari? I spelled it for her. She went to talk to another “bartender” and I saw him shake his head. She came back over and said “We don’t have Campari”. I pointed to it just behind her and said “It’s right there next to the sweet vermouth”. So she gathered up the Plymouth Gin, vermouth and Campari and asked me how to make it. I gave her the easy, step by step instruction and, together, we made this complicated cocktail happen! I’m sure they will have “real” bartenders at some point since I read about the desire to have a good bourbon program (and saw the many selections behind the bar) but right now, unless you want a beer (served in a mason jar) you may get to provide a “teachable moment”. When you cut it, mama, save me a slice"
DMChicago wrote: ...unless you want a beer (served in a mason jar) you may get to provide a “teachable moment”. It's not a mason jar. It's a "drinking jar," complete with a label that clarifies said nomenclature along with a silly little glass handle. Having a beer at Barn, I felt like I was drinking tea in a biology lab run by Hugh Heffner. Didn't eat, but 'twas awfully fun to overhear the baby-faced Depaul crowd talk about how much better these ribs were than anything they'd ever eaten before. I dropped by for lunch on Sunday as well and was glad I did. I noticed the bartenders as completely clueless as well, but at least friendly. They weren't sure which brews were were made in Chicago when asked by another customer, so I just told them myself. 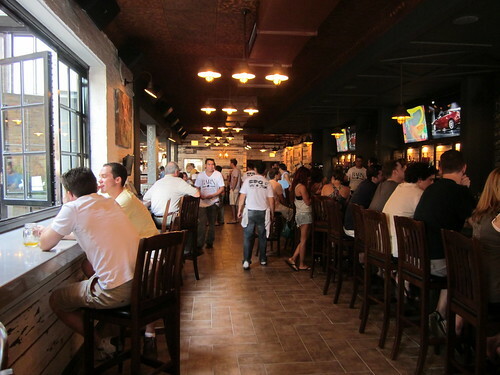 I did think that they stocked a reasonable number of decent beers, at least 15 drafts, most of them microbrews. I had the sampler to eat, since that was what's currently available and was very impressed. Pulled pork sliders were tasty. 2 sauces on the side, one smoky, one vinegary, both with great depth of flavor. The sauces weren't really identified by the bartender though. She just said they were both BBQ and one was pointed out as being spicier than the other. That's it. They should probably just put stickers on the bottles with a better description. The ribs were the absolute star of the show. Best ribs I've had in many years, and hands down the best in Chicago, in my opinion. Toothsome as David mentioned, with incredible flavor in the rub, and crispiness at the edges. These ribs make me remember why ribs made right don't need to be sauced, despite the fact that I am the type of guy who usually likes slathering sauce on ribs. The coleslaw side had a refreshingly small amount of mayo, but could have used a spicier or vinegar bite. Having this place in the middle of Lincoln Park makes me smile at the convenience and exposure. Can't wait to see the full menu. Lancelac wrote: These ribs make me remember why ribs made right don't need to be sauced, despite the fact that I am the type of guy who usually likes slathering sauce on ribs. Did your ribs look like the ones pictured in the OP? They had plenty of sauce from the finishing process. 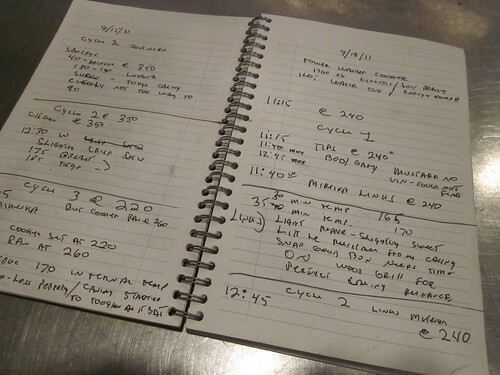 As a fan, I'm trying to decipher the dates and other hints in GWiv's bbq logging notebook for a peek behind the curtain. BrendanR wrote: As a fan, I'm trying to decipher the dates and other hints in GWiv's bbq logging notebook for a peek behind the curtain. ME: Can I get a pic of a page from your notebook? ME: No one is going to get any trade secrets from this, are they? Apparently, now the competition knows that GWiv has invented time travel, which I had recently been told was scientifically impossible, so that's good news. Does anyone know what the hours on this place are/are going to be? Will it be open as a bar later in the night or is it just normal restaurant hours? I just realized that this is the location of the old Club 950 Lucky Number. I spent some very interesting evenings there back in the early 80's. You ever try to reach DaVinci's scrawl? Equally impossible. claypoolfan wrote: Does anyone know what the hours on this place are/are going to be? Will it be open as a bar later in the night or is it just normal restaurant hours? I sent an email to the "contact" link on their website. I'll post if/when I get a reply. Couldn't tell you the hours, since in my heat-stroke-induced state, I was delirious. But I do remember a voice saying to my prostrate, dehydrated former self, as I lay on the sidewalk yesterday at 12:30 pm: "We'll be open to the public on August 10!" Makes sense that Gary would be using DaVinci's mirror writing to protect his secrets. However, if he is, then those aren't time travel calculations, it's the formula for cold fusion, which will probably have a far greater impact on the rib business than time travel would. mrbarolo wrote: Makes sense that Gary would be using DaVinci's mirror writing to protect his secrets. However, if he is, then those aren't time travel calculations, it's the formula for cold fusion, which will probably have a far greater impact on the rib business than time travel would. I disagree. Time travel essentially turns a pitmaster into a short-order cook, as he can reach across timelines and grab an 18-hour smoked brisket that he put into the pit three minutes ago. That would be the single greatest culinary innovation in the histories of man. Cold fusion, though, does nothing for us unless Gary decides to abandon the whole hardwood-smoked meats thing and zaps it in the fusion oven. Wow, I can't believe how stupid you are. That oven wouldn't be able to cook anything, it's COLD. It would do wonders for cold smoking salmon, though.